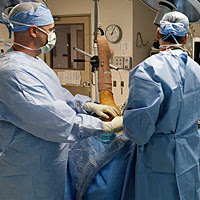 Orthopedic surgery has been a miracle to many people. These people were in excruciating pain, and with a surgery performed by an orthopedic surgeon, they are now enjoying their life the way they were meant to. Before you seek services from an orthopedist, it’s important to understand what orthopedic surgery is and what it is not, so you can tell whether it’s right for you. If you’re interested in seeking the services of an orthopedic surgeon such as those of Glousman, Ronald, look for the following qualifications. Orthopedic surgeons must complete four years of college, and then four years of medical school. After medical school, they have to do a residency at a facility that performs orthopedic surgeries. This residency should last for five years and include one year of general surgery training. Some orthopedic surgeons decide to further their training by doing a fellowship. This is usually done to do research and learn about the orthopedic field more in depth. During training, many surgeons decide to specialize in a particular area of the musculoskeletal system such as the hand, shoulder, elbow, foot, spine, etc. Many will specialize in more than one area to help as many patients as possible. Now that you know more about orthopedic surgery, consider setting up a consultation today. It may just be the procedure to take back control of your body and life.